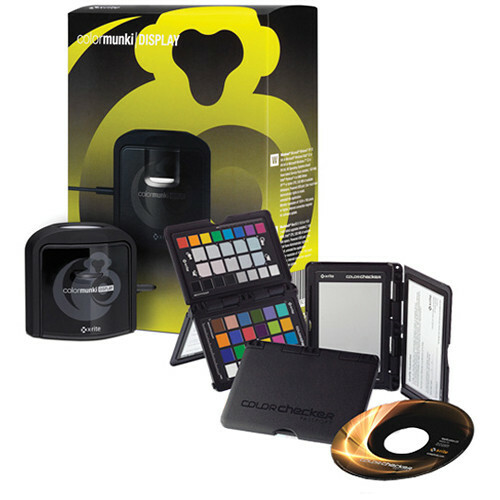 The X-Rite ColorMunki Display and ColorChecker Passport Bundle provides you with both the ColorMunki calibration and profiling system and the ColorChecker Passport for reducing processing time and improving quality control in your RAW file workflow. ColorMunki accurately portrays on your display / projector the color in your original picture or digital file. ColorMunki makes it quick and easy for you to calibrate and profile your displays. It features an advanced and ergonomic multi-functional measurement device, as well as easy-to-use software with simple one-click presets or wizard-driven options for more control. The ColorMunki Display incorporates advanced filter and optical systems, fast measurement speed and unrivaled color accuracy on all modern display technologies, including LED and Wide Gamut LCDs. It's also spectrally calibrated, which makes it field-upgradeable to support future display technologies. ColorMunki's ergonomic design incorporates 3 functions - ambient light measurement, monitor profiling, and projector profiling - into 1 sleek, compact and fully integrated device with no parts for you to misplace. A custom-designed RGB filter set provides accurate color measurements, while the optical design allows for high rates of repetition on the same display and across different display types for more consistent color matching. There's even a rotating diffuser arm that can be used as a stand for table top projector profiling, ambient light measurement, or as a cover for instrument optics. The conveniently integrated tripod mount is great for projector profiling in larger venues. The software features both 'Easy' and 'Advanced' options, so you can choose the one that's right for you. The wizard-driven interface guides you through the profiling process in small, easy-to-follow steps. No knowledge of color science is required - "Easy" mode is as simple as pushing a button, while "Advanced" mode provides additional pre-defined options for those users who want more color control. Before and after images show instant results and the handy profile reminder notifies you when it is time to re-profile your display. The on-screen help guides and videos are easy to understand and follow, so there are no extra manuals needed. The Ambient Light Measurement tool automatically determines the optimum display luminance for comparing prints to your display, based on a measurement of the lighting conditions where the prints will be viewed. Ambient Light Smart Control lets you choose whether you want ColorMunki to automatically adjust your profile or simply notify you as ambient light conditions change. Flare Correct measures and compensates for reduced contrast ratios caused by flare light (glare) falling on the surface of your display. By accurately measuring your effective display contrast ratio, ColorMunki gives you a more precise display profile. Intelligent Iterative Profiling is an adaptive technology that measures and analyzes the color capabilities of each unique display, in order to provide maximum accuracy every time you profile. The Automatic Display Control (ADC) feature adjusts your display's hardware to speed up its operation, eliminating manual adjustments--so there's less work for you. ColorChecker Passport streamlines your workflow by letting you quickly and easily capture precise, true color, immediately enhancing portraits and landscapes while preserving color control and consistency throughout all phases of the process, from capture to edit. Any photographer seeking more accurate, consistent color and creative versatility should consider the Passport as a viable solution. Create your look via enhanced patches, evaluate shadow details and highlight clipping, and manage color shifting, as well. Plus, create DNG profiles using an industry-standard color reference target. Perform custom in-camera white balance, eliminating the need to correct the individual images later on. Benefit from Creative Enhancement, Classic, and White Balance targets, as well as camera calibration software with an Adobe Lightroom Plug-In for generating customized DNG profiles quickly and easily for Adobe Imaging solutions. Make global corrections based on accurate info and achieve consistency throughout your images. Though optimized for RAW shooting, ColorChecker Passport will also work well with the JPEG format. Included with the Passport is an adjustable protective case. Note: Testing is still being conducted with plasma displays to try to correct one or more reported issues. ColorMunki may not work on plasma displays. Also note that the ColorMunki software can be downloaded from their site even though discs are included. Also, the ColorMunki is capable of adjusting the color calibration settings of a computer's video card to produce accurate color representation on an attached monitor or LCD projector. It will not function for DLP projectors or home theater projectors. Works on virtually all modern display technologies, including LED and Wide Gamut LCDs, and is also spectrally calibrated, which makes it field-upgradeable to support future display technologies! Box Dimensions (LxWxH) 7.7 x 5.8 x 3.1"
ColorMunki Display and ColorChecker Passport Bundle is rated 4.5 out of 5 by 29. Rated 1 out of 5 by Jillian from Doesn;t Work I'm so shocked this product has good ratings considering I had a horrible experience with it. I bought it from a local camera shop and when I used it, it made my colors all brown and muted and weird. I tried on different computers and multiple times - same thing. I called their support line a lot to get it figured out and they were pretty rude and terrible. They never called back when they said they would and it took forever to troubleshoot with them. It wasn't working so they sent me another. That one did the same thing. Finally I was able to return it for a refund. I'd never recommend or use anything from this company again. Rated 5 out of 5 by Wes from Can't Believe I Waited So Long! I love both of these products! Seeing the before and after with the ColorMunki is amazing. My display wasn't completely off, but it was far enough to make a difference. For any photographer that expects to print photos, this is absolutely necessary. I no longer have to worry if my photos will turn out properly! There is one con though that I didn't remove a star for. The software is poorly designed, I have a high resolution QHD display on my laptop and the text in the software runs off the window. I can still set the color but there's no reason this simple issue should still exist. I haven't used the ColorChecker Passport much yet, but I've tried it and it seems super simple to use. The grey card is nice but where it really shines is on the other side with all the different shades of grey and the colors. It makes checking colors and setting white balance a breeze! Rated 5 out of 5 by L Stephanie S. from No Monkey Business Here! I purchased the X-Rite Bundle because I needed a color calibration system immediately and wanted to experiment with the ColorChecker Passport in future photography projects. First, the ColorMunki Display: 1. Fabulous, fabulous, fabulous!!!! 2. Purchased on the recommendation of several of the labs that I use because a) it's what they use to calibrate their systems; b) images processed on my existing system (a laptop) routinely had a yellow cast when printed, and c) after my laptop's near-death experience, I invested in a proper system with a professional-grade monitor. Correct calibration would now be possible. 3. The Display has great versatility. I can calibrate my static monitor, a projector (when I get one), and, yes, EVEN my laptop! 4. Before I could set up my new system, I had a rush order that couldn't wait. I took a leap of faith, used the ColorMunki Display on my laptop, and the results were stunning! I had had no idea that calibrating my laptop monitor would make such a difference. IT DID. No more yellow cast. Colors in the printed images were the same as real life. No more reprinting orders! 5. Calibrating with the Easy option was, well, EASY! 6. Bonus feature: Ambient Light monitoring. I don't remember paying any attention to this feature when I was trying to make a decision on which calibration tool to purchase, but the unit will monitor the ambient light in my work space and make adjustments accordingly. Yippee! 7. When making my final decision to purchase this product, as opposed to purchasing a more sophisticated version from the same maker, it seemed to me that the only real difference (besides price) was the time necessary to calibrate a monitor. The ColorMunki Display takes five minutes; the more advanced model calibrates in about one minute. Considering that both products recommend allowing the monitor to warm up for thirty minutes before initiating calibration, a four minute reduction in calibration time was not worth the additional expense. Others may feel differently. Second, the ColorChecker Passport: 1) I purchased this product as part of the bundle because several instructors recommended using one, especially with reference to capturing accurate skin tones in digital photography. 2) I have yet to use it, but I'm looking forward to seeing whether or not it makes a difference in my final printed products. Rated 3 out of 5 by Kelly from ONLY handles DNG and RAW files...NOT JPG I needed a simple color standard card to include in photos of museum objects to allow later color correction. The catalog information, and phone support person said the software package would support correction of JPG files from the camera I am using. It does NOT, and this was confirmed by the Xrite techsupport folks--hence the low rating. On the positive side, the display correction system is awesomely simple to use, and the color standard card set is equally great. Rated 4 out of 5 by RK from The easiest calibrator I have used. I work mainly on laptops and had the chance to shoot on set with a Mamiya Phase One AFD II. My laptop was color calibrated and a monitor on set, an Eizo, Eizo ColorEdge CG277, was found. I was highly interested in wondering if the colors on my laptop were calibrated as well as they are on the Eizo since it has built in color calibration. To my surprise, the ColorMunki display was nearly identical in colors to the quality of colors in the Eizo monitor! Not bad for having it for about a month since calibration!! The instructions on the program are extremely easy to follow, the color calibrator comes out every end of the month for my laptops, and the price is great if you're a student! Rated 5 out of 5 by Jonnie from Works great, and my prints now match what I expect I got this out of desperation. When I started doing prints, I would edit them, upload to my printer, and they would come back looking dark with wack colors. I did a little research, and decided on the ColorMunki display. This was not an investment I really wanted to make, however I'm very glad I did. It works good, is simple enough to use, and most importantly, I know am able to know what to expect from the printer. It does take some time to calibrate...about 5 mins. I do this every time I'm editing something that might possibly be printed to deal with different ambient light conditions when I am editing. I do not know if there are any faster calibration devices, but its not a big deal. The software says you should recalibrate every week. Its very small and travels easily, generally it sits on my desk in Florida, but I've used it everywhere from a picnic tables in national parks, to a hotel room for headshots of a client (who was extremely impressed when he saw it). This year it has crisscrossed the country two and a half times, traveling over 16,000 miles in a car and the rest on planes. It has become an essential piece of gear that rates right next to spare batteries. I use it on a macbook pro. Very happy with the purchase. Rated 5 out of 5 by photo larry from screen and prints are a close match calibrated 3 screens. Two of the three screens now look close to my print from a canon pro 100 printer. The third is a old laptop computer in which it did improve the looks of the screen. Rated 4 out of 5 by Adam from Why didn't we buy this sooner ! The product is great and we got a fantastic price on this bundle. After color balancing our monitor the prints from our lab matched what we saw on screen. If we made small color adjustments, then the prints accurately represented those adjustments. Why did we wait 10 years !!!??? The only reason I give it 4 stars was the included CD had very old software that couldn't install on Mac OS 10. It was also difficult to find the current download on X-Rite's web site. Once I found the correct file the install and color balancing was smooth and easy. will this also calibrate my printer ? Ina word...no. Youll need the ColorMunki all-in-one. I don't have dvd drive can I download software from internet?? Or do I need to get a dvd drive? Yes you can they have all software available via the website. I have a Mac Mini with no CD/DVD drive and loaded the software via the website. Would the Color Checker Passport enable me to scan it in my scanner to use it as a base for creating an ICC profile in the scanner (for accuracy of colors from the scaner) . Is the Color checker flat and easy to lay flat on a flatbed scanner like the Epson Perfection V600? The color chips are recessed in a plastic mold. Hope this helps. It's not listed in the specs because the specs haven't been updated. I have Yosemite and yes, it does work. I use Windows 10 with no issues. Make sure you keep your video drivers updated. I'm wondering what is the difference between this kit (B&amp;H # XRCMUNDISCCP MFR # CMUNDISCCPP) and the same kit with the item number (B&amp;H # XRCMUNDISCCQ)? Are the color checkers different? Perhaps with or without the 'Sekonic' grey card? Also noticed that there are two separate versions of the i1Display Pro with colorchecker 'Kits' as well Would like to hear an accurate answer as to the difference between the version, thanks! Does this work with Macbook Pro with retina display?